Prior to applying to the Kellogg Biological Station (KBS) to work as an REU (Research Experiences for Undergraduates), I did not have any research experience. 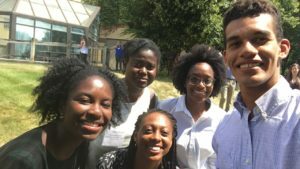 I was thrilled when I found out that I had been given the opportunity to participate in the REU program. Before arriving at KBS, I was very nervous and had no idea of what to expect. Reality set in rather quickly for me on the drive to KBS from the airport. I received a very warm welcome (it reminded me of home) upon arriving at KBS and after meeting everyone, I knew I would fit in perfectly. To my surprise, choosing to come to a place that I knew nothing about turned out to be an incredible experience. At times I felt like I was dreaming; I never could have imagined that I would be blessed with this amazing opportunity. 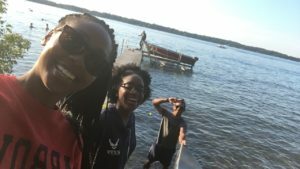 Before picking my research project, I planned out many things I wanted to accomplish during my REU experience. These things included overcoming my fear of planning and conducting a research project from start to finish, learning many new things, and presenting my research at the end of the summer. Here at KBS, my original project was going to be looking at the reproduction rate of aphids on genetically diverse plants. 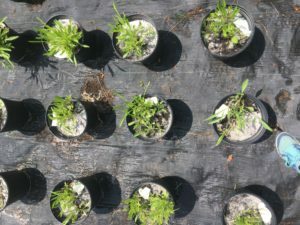 I planted different source populations into mesocosms to simulate prairie communities. I used seeds that were native to Michigan, the Midwest, the South, or a mixture of all three. When it was time to add aphids to the mesocosms, the aphid colony was no longer available. My backup plan was to use slugs and look at their growth rate and how much plant material they consumed. For this part of my experiment I set out traps to collect slugs. For each trap, I placed a paper towel in a plastic cup and poured just enough beer to cover the paper towel. I then placed the trap in a high grass area in the ground. Overnight I trapped one hundred and fourteen slugs and then weighed each one. I used twenty mesocosms and placed five slugs in each one. After one week, I went to collect my slugs and did not see any of them in the mesocosms. I then came up with the idea to put a beer soaked paper towel in each one to try and bring the slugs out of the soil. So, the next morning I went to collect the slugs and still did not find any. At this point I was desperate so I dumped all mesocosms out of their pots and searched through the soil for the slugs. I still did not find any slugs and that’s when I realized the slugs had escaped. The mesocosms KBS REU Lauren Davis used to study how genetic diversity affects plant composition. I had to quickly come up with another backup plan because the poster symposium was fast approaching. I still focused on the mesocosms I had planted and decided to look at how genetic diversity affects plant composition. For my new experiment, I measured percent cover, counted leaves, and measured the height of individual plants within each mesocosm. My data shows that different ecotypes and levels of genetic diversity within a population can affect plant community composition. Genetic diversity also plays a role in how well certain species grow. To my surprise, the seed populations native to Michigan did not germinate. In some cases, the Southern or Midwestern ecotypes did the best. This makes choosing seeds for restorations difficult. I can definitely say I ran into a few hurdles throughout my research and that some days seemed never ending. 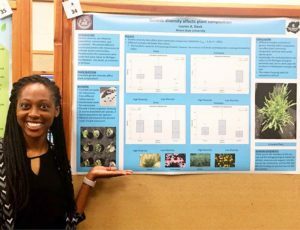 From not having any aphids to put on my plants and having my slugs escape, I became frustrated and worried that I would not have any data to present. I was able to overcome the challenges that I faced and still accomplish the goals I had set. After meeting with my mentor countless times and going over numerous pages of data, I was ready to make my poster. I was in a frenzy while making my poster and practicing my “elevator speech,” but my poster presentation turned out to be everything I imagined it to be. My poster presentation at the KBS Undergraduate Symposium was a great way to communicate my results and a nice way to end my summer experience at KBS. A bunch of the REUs before the KBS Symposium. This experience has allowed me to make many lifelong friendships with the other REUs. 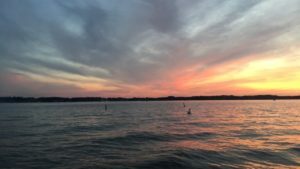 We truly enjoyed ourselves in our free time by trying new things, watching the beautiful sunset sitting on the dock, or just hanging out having endless conversations. I remember the day I tried canoeing for the first time and was freaking out, because I was certain the canoe would flip over sooner or later. I made it back to land completely dry and have enjoyed canoeing ever since that day. Spending a lot of time with the other REUs made my experience even better. I am leaving KBS having learned a lot during my time here. I will definitely use my learning experiences in the many endeavors I will take on in the near future. This research experience has truly served me well, and I’m truly grateful to have had this amazing opportunity. KBS REUs Daijah, Daimer, and Lauren trying canoeing. Sitting on the dock watching the sunset.